Disgraced main character would have "gone rogue" in the follow-up before rallying soldiers to his cause in game three. 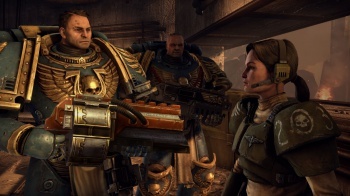 The former director of 2011's Space Marine revealed he had a three game story arc planned out for the series. Space Marine, based on the Warhammer 40,000 setting, cast players as Titus, one of the titular chainsword wielding Ork-slayers. "I had some big plans for Titus," Raphael van Lierop, formerly of Space Marine developer Relic Entertainment, told the Penny Arcade Report. Unfortunately, the business realities of publisher THQ skewered any chance that players would receive resolution to the game's cliffhanger ending. "Sadly, THQ was already starting to fall apart by then and it became clear that Space Marine 2 wasn't going to happen. I was pretty heartbroken about that," van Lierop said. THQ declared bankruptcy near the end of 2012, with its case just wrapping up this summer. So, what would have happened to Titus had his story continued? The ending to his game - and, obviously, there are spoilers ahead - saw the soldier dragged away in chains under charges of heresy after battling the forces of Chaos. "The second part of his story was to focus on a 'Titus Unleashed' plot ... basically there were forces arrayed against him that would see his loyalty to the Adeptus Astartes pushed to its limit, and his reaction would be to kind of 'go rogue,'" van Lierop said. "He would survive, and come back even stronger in the third game, where other Space Marines still loyal to him would rally around him and he'd return to 'clean house,' but as the head of a brand new Chapter that we would build around him." Van Lierop is currently hard at work at his new studio, Hinterland. Their first game, The Long Dark wrapped up its Kickstarter campaign earlier this week netting over $250,000 of its $200,000 goal. The studio also announced that David "Solid Snake" Hayter would be among the game's voice cast.